Create a radiant glow with this illuminating powder that highlights the skin with a sheer wash of shimmering color. Infused with Vitamin E, Jojoba, Sunflower, Almond and Grape to help nourish and hydrate the skin. Long lasting color can be worn wet for a vibrant effect or dry sheer pigmentation. Even though the brand doesn't mention in its description but there is a lot of talk about the fact that the top layer of this highlighter needs to be scraped off or removed in order to get its real pigment out. And after trying it, I can say, that yes, it's true. 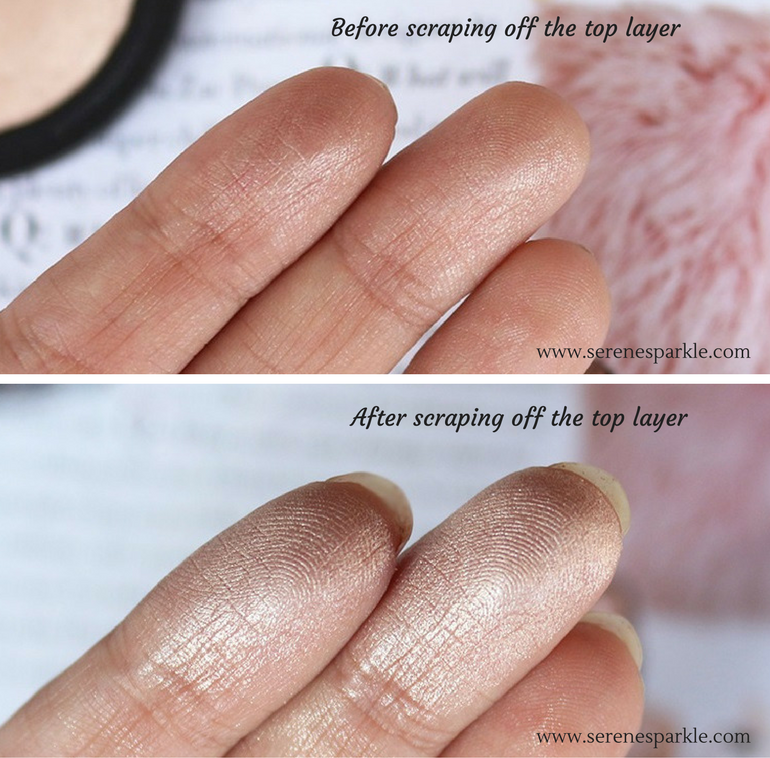 Before scraping off the top layer, the texture feels a little chalky and there's barely any pigment. You'll need to layer it a number of times for the highlight to actually show up on your face. But once you scrape off the top layer (I'd suggest scraping it with something a bit sharp), the highlighter reveals its true potential. Highly pigmented, smooth and lightweight are the first few words that popped into my mind when I swatched it after scraping off the top layer. It is just so so pigmented underneath its top layer, I was very much surprised. 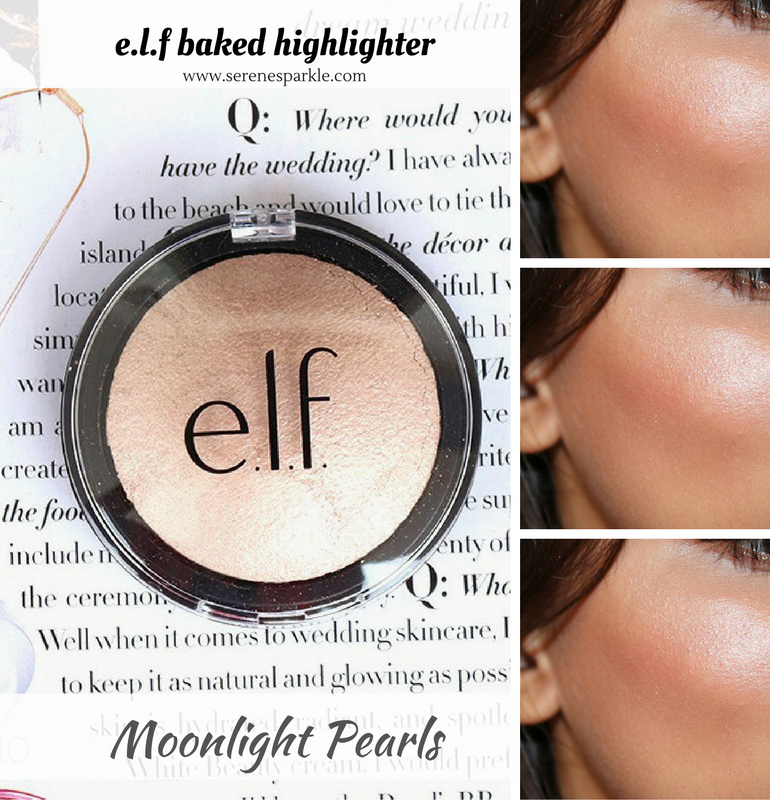 e.l.f baked highlighter in the shade moonlight pearls is a mix of silver and golden champagne hues. It's more dominated by ultra fine, pearly white, reflective shimmer particles, which give a nice, almost metallic, luminous sheen to the skin. The shimmer doesn't feel too glittery or chunky. The texture is very smooth and lightweight. It has a baked, powder formula and can be applied both wet and dry. It blends easily and is quite buildable too. The highlighter doesn't make my skin appear dry and powdery. 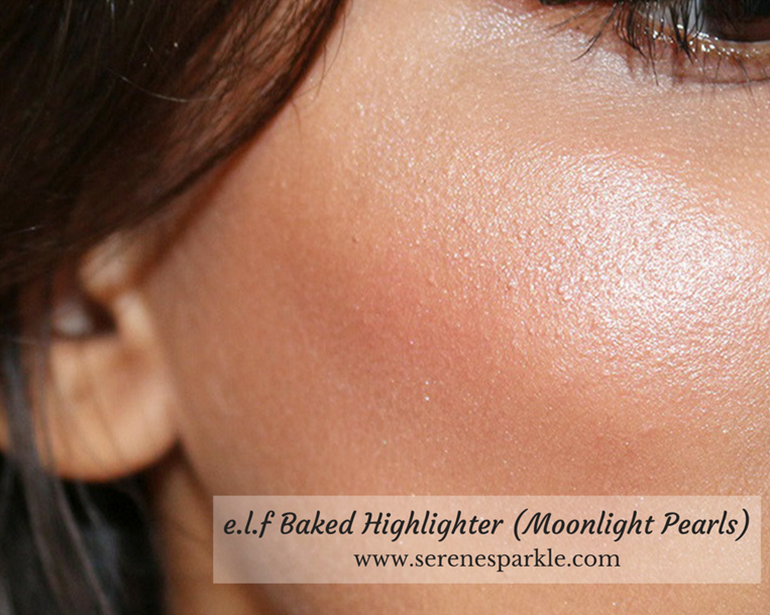 My skin tone is between fair and medium and this highlighter looks quite flattering on my complexion. It's not too warm or too cool. On deeper skin tones it'll appear intense instead of natural, 'apricot glow' would be a perfect match for deeper skin tones instead of the shade 'moonlight pearls'. Whether you're heading out for a glam evening or want just a subtle, natural glow for a day time look, e.l.f baked highlighter has got you covered. A fan brush would do the job of giving that perfect subtle highlight, while a dense highlighter brush would be a more appropriate choice for a dramatic glow. I didn't have either. So, I used my real techniques contour brush and it worked amazingly in giving a dewy, dramatic look to my face. 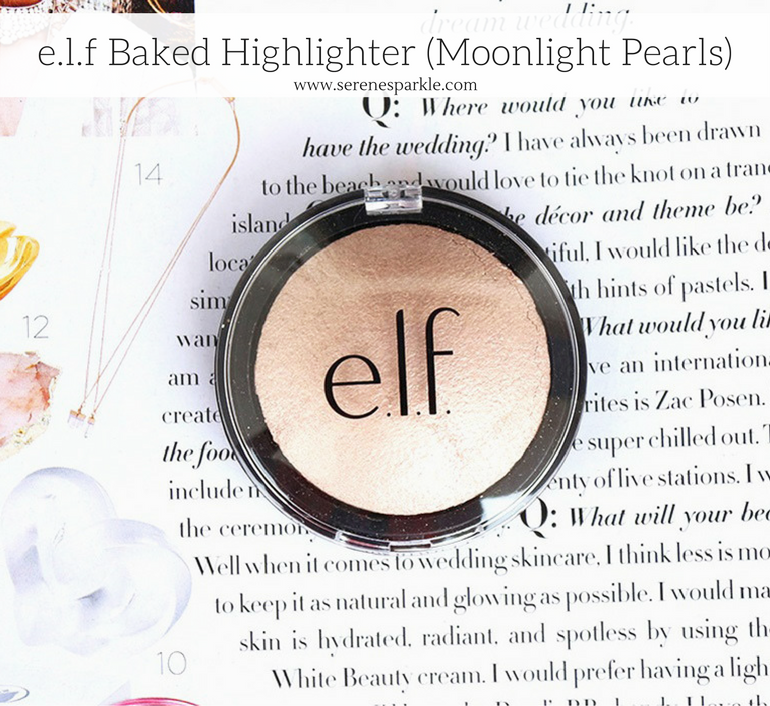 Overall, this is a stunning highlighter! An absolute must have if you don't want to spend too much on high end highlighters. It wears well throughout the day and comes in four different shades. Highly Recommended! What do you think of this highlighter? Thanks for the lovely review.. Never knew about that website.. Will definitely check it out.. This looks so pretty on your skin, and I love the way you take photos! That highlight looks sooooooooo good on your skin!!! I'm obsessed!! Looks like a must-try product. Thanks for sharing your review dear! This looks like such a lovely highlighter! And it's super affordable as well! Such a gorgeous highlighter. And I totally love the pricing.